15 kms from Agra, Dayal Bagh, also known as Soamibagh, houses the samadhi of the founder of Radha Swami faith, 'Swamiji Maharaj'. 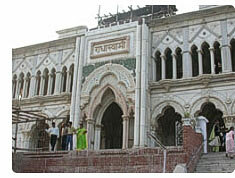 The main structure is a majestic building, 110-feet in height, built of pure white marble. The belief here is that construction work should never end, making it into a living monument, hence it is under construction for almost 100 years.